Last October around this time I was in New England enjoying the fall foliage. The beautiful maple and oak leaves turning into orange and red, smelling the batch of hot clam chowder, looking through the displays of Jack-o’-lanterns on every house, I literally soaked up myself with seasonal beauties. Well…, the scenery has changed. I am surrounded by the palm trees, and the famous Patronas twin towers can be seen through my bedroom window. Yes, I am in Kuala Lumpur, Malaysia. Please, don’t ask me how I like this city…, yet. Changes can be adaptable. We are capable of that, aren’t we? 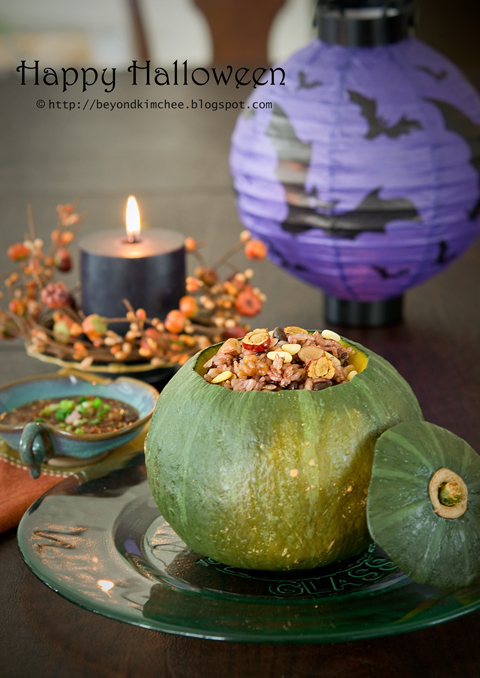 Halloween is coming near, so I would like to present my Fall rice in Pumpkin. I was looking all over for the orange Jack-o’-lantern pumpkins in this tropical land, but nowhere to be found. But hey! if there is no orange, then, go with green! 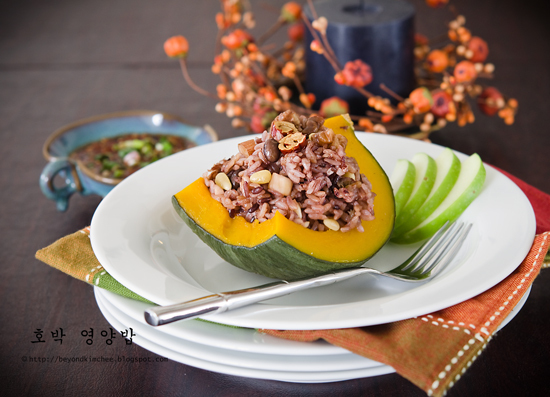 Koreans call this dish “Nutritious rice with pumpkin, hobak youngyang-bap“. It is nutritious because it has all kinds of nuts, dates, and different grains of rice all mingled to create a wonderful fall flavored dish. 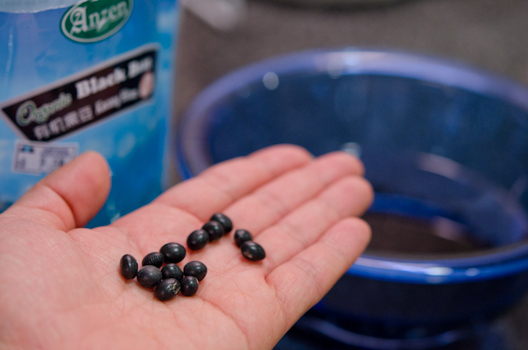 First, take some black beans and soak in the water. 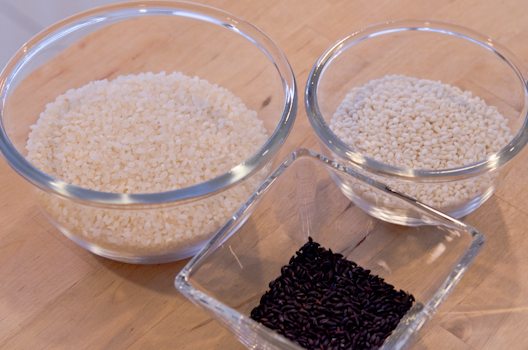 These are short grain white rice, sweet (glutenous) rice, and black rice. Rinse several times until water gets clear. And let them soak in the water for 1 hour as well. 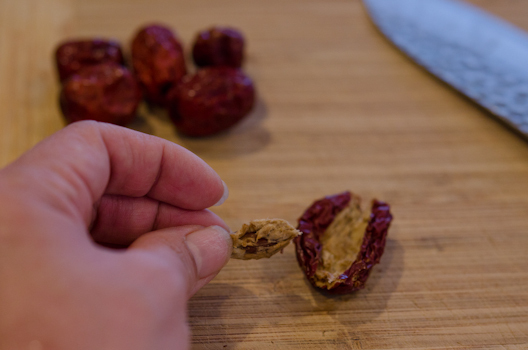 Meanwhile, remove seeds from the dried dates. and slice the dates. 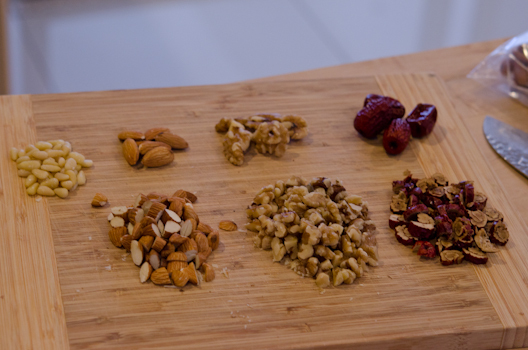 Roughly chop nuts of your choice. I used walnuts, almond, and pine nuts. 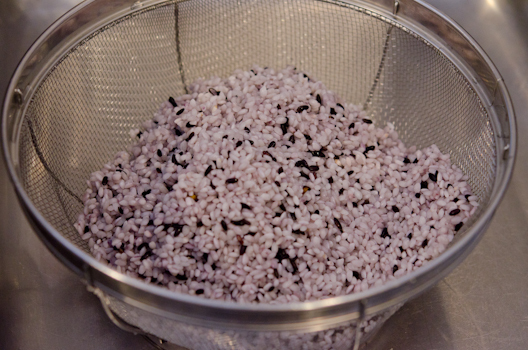 after 1 hour of soaking, this will happen… Natural dye from black rice. 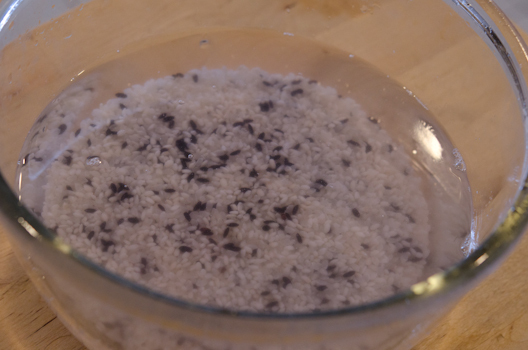 Transfer into a rice cooker pot with soaked black beans. 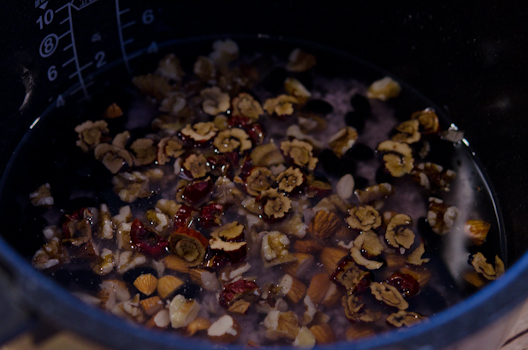 Add the chopped nuts (except the pine nuts), and pour water. You will need less water than usual since the rices are already soaked. and a few drops of non flavored oil. Why? This will give a little sheen to the rice. 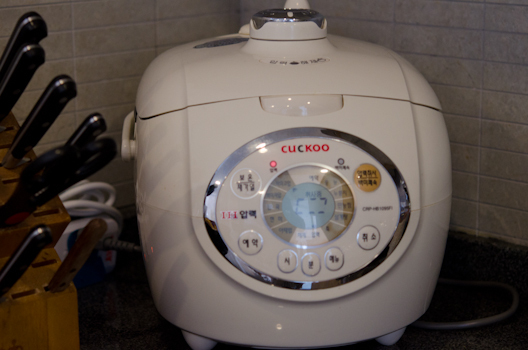 * I use electric pressure rice cooker which most Koreans use these days. 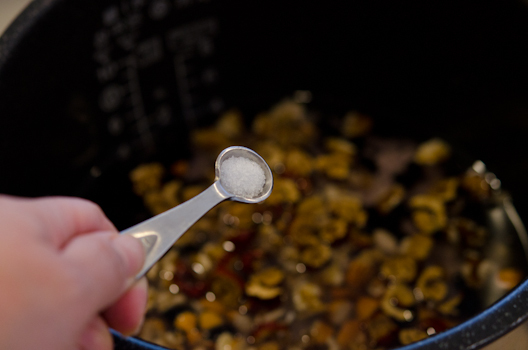 If you use ordinary rice cooker, You will want a little more water. Just cut out the top portion. 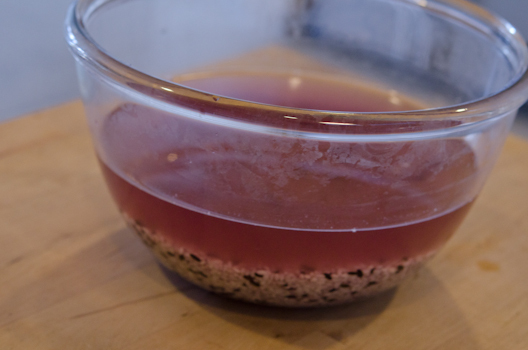 Scoop out the fibers and seeds. The rice is ready. All the nuts and beans are floating on top. You need to add the pine nuts at this point to mingle with them. Put your rice in side of your pumpkin. I used rather a small pumpkin so couldn’t fit all the rice. You can use more than one pumpkin or use one big one. Put the lid back on and place in a steamer. 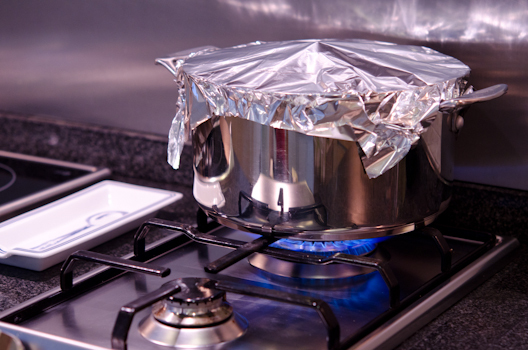 Cover the pot with lid or foil if your lid doesn’t fit like mine. 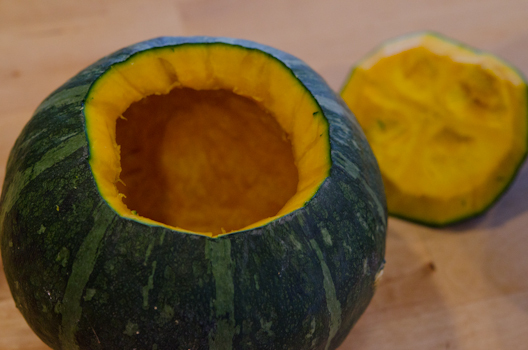 Crank up the heat and steam for 40 minutes or more depends on the size of your pumpkin. 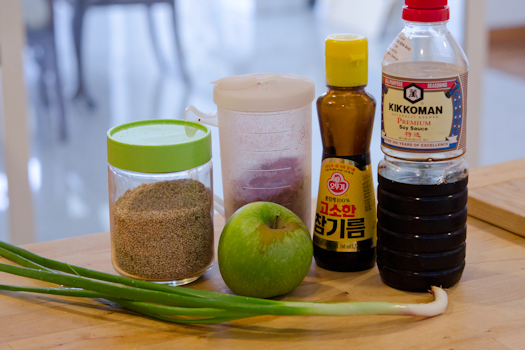 Sesame seeds, Korean chili flakes, sesame oil, soy sauce, apple, and green onion. 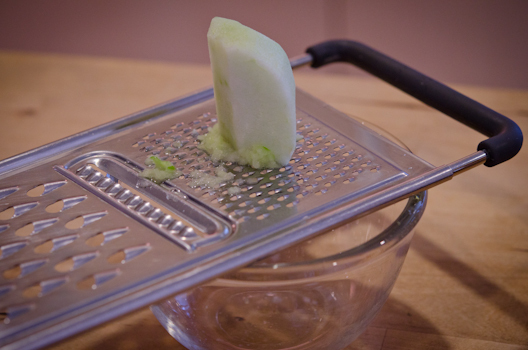 Grate your apple, not the i-mac. Add all the other ingredients and mix well, babe! Hmmm…, the pumpkin looks ready. Test with your knife if it goes all the way in effortlessly. Now it is ready to serve. Take it out carefully. When you put rice in it. 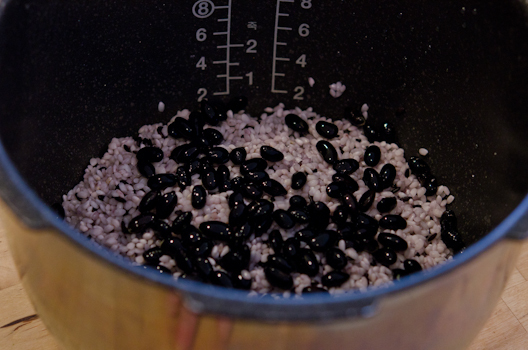 Soak black bean in the rice for 1 hour. 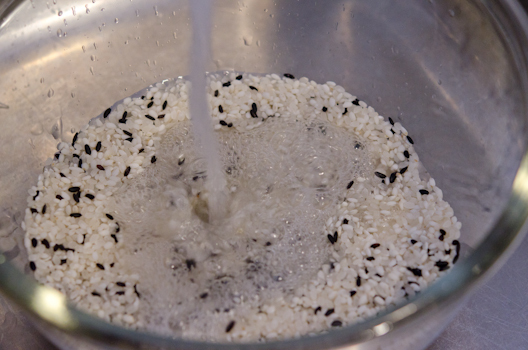 Combine rices and rinse them until the water gets clear, then soak in the water for 1 hour as well. 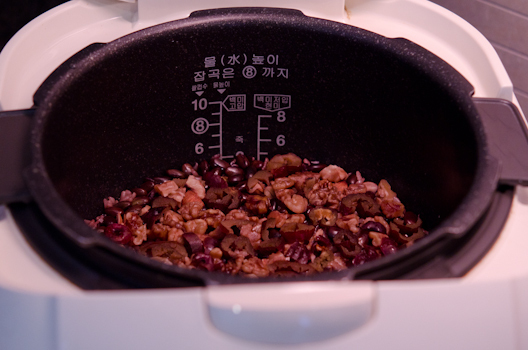 Drain the water and combine rices and beans in the rice cooker. 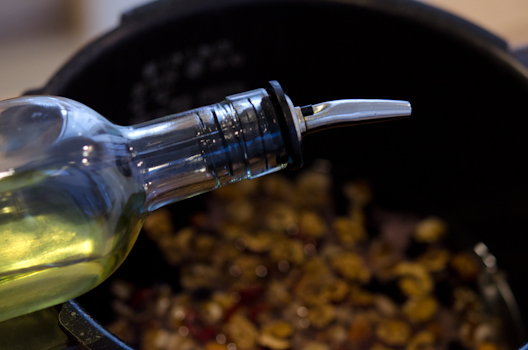 Add nuts (except the pine nuts), dates, salt, and oil. 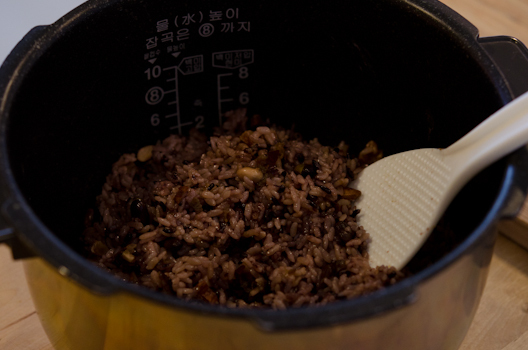 Pour 2 1/2 cup water to the pot and let the rice cooker do the cooking. Meanwhile cut out the opening on the top of pumpkin. Keep the top. Remove the seeds and fiber inside. 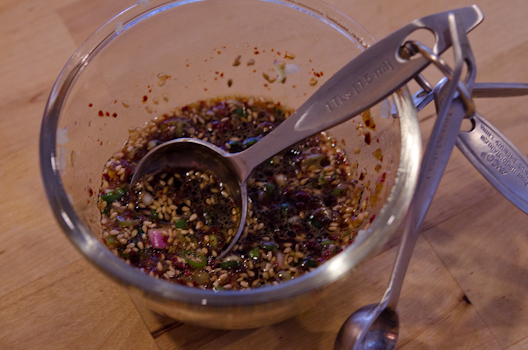 When the rice is done add the pine nuts and toss well with a spoon. 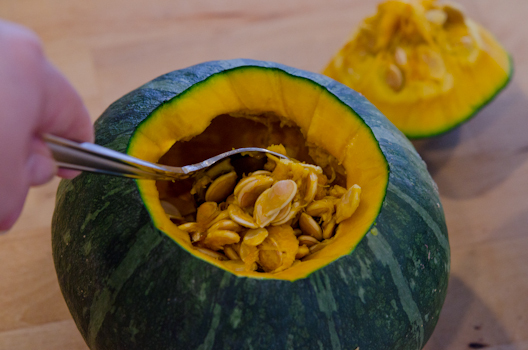 Scoop the rice into the pumpkin. Return the pumpkin top to cover the opening. 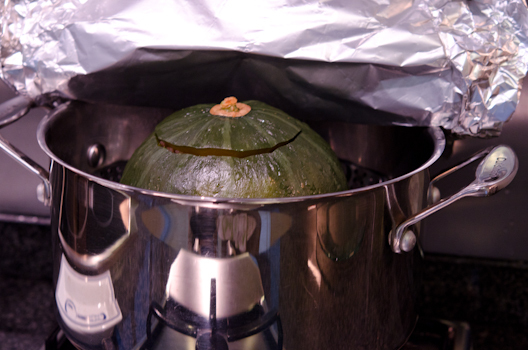 Place the pumpkin in the steamer and cover with lid or foil. 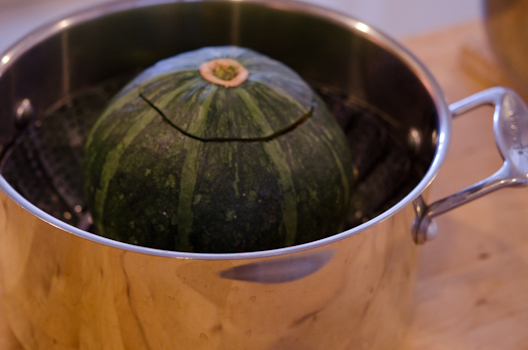 Steam over medium heat for about 40 minutes depends on the size of your pumpkin. 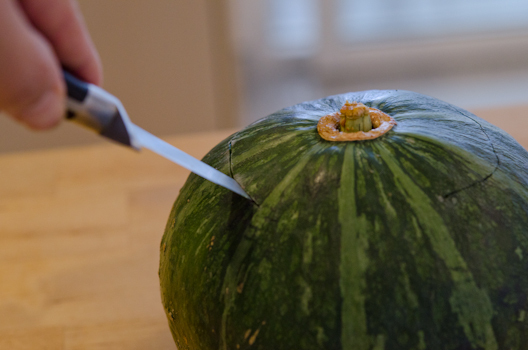 When a knife goes into the pumpkin effortlessly it is done. Carefully take out the pumpkin and place on the serving platter. Slice pumpkin into wedges and gather up the rice on top of pumpkin wedges. Drizzle the dressing over if you wish. This looks amazing! I have a Korean rice mix that has beans and the different rices in it. (Do I just soak the whole mix?) I haven't figured out how to use it and now I know. I am going to try this soon. absolutely lovely! what a great post! So that's where you are! I am sure you'll like it there soon. 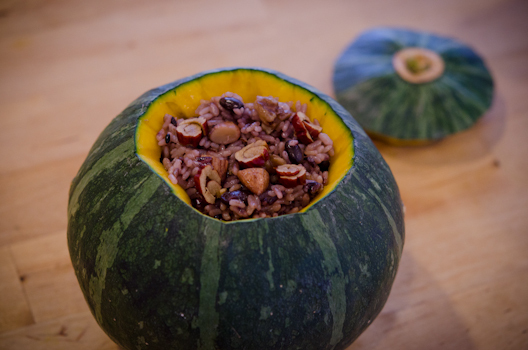 I made this rice stuffed kabocha last week also but never got to post it. You beat me to it. (lol) I like your idea of adding almonds and walnuts. Thanks Joanna. Yes, you can use the mix. Just soak however much you need in the water. They are tasty and healthy at the same time. Thanks Hyosun. You better post your dish soon. Can't wait to see it.